Serving our community in enabling youth to benefit from participation in team sports and activities in a safe and structured environment. Pop Warner programs teach fundamental values, skills and knowledge that our youth will use through out their lives. 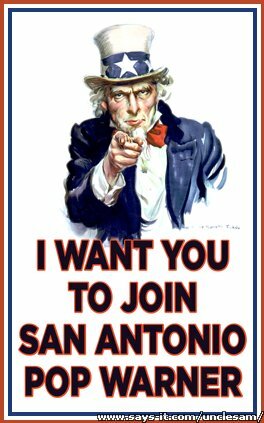 The San Antonio Wolverines were founded in 1999 by Coach Tom Salas, President and Coach Tony Alfaro, Athletic Director. Other officers were Doug Tulon, 1st Vice; Mike Alfaro, 2nd Vice; Veronica Garza, Cheer Director; Mando Pena, Treasurer; and Norma Salas, Secretary. The Wolverines quickly established their presence by winning a Jr Pee Wee National Championship in Cheerleading in their first year under the direction of Coach Norma Salas. NOTE: All American Scholars are those Wolverines who maintain a grade average of 96 or better!